The funny thing about design is the more you find yourself attuned to it, the more the mundane items in your life seem to need a face lift, all the way down to the push pins on your cork board. Why not, after all, have pretty ones if you can? 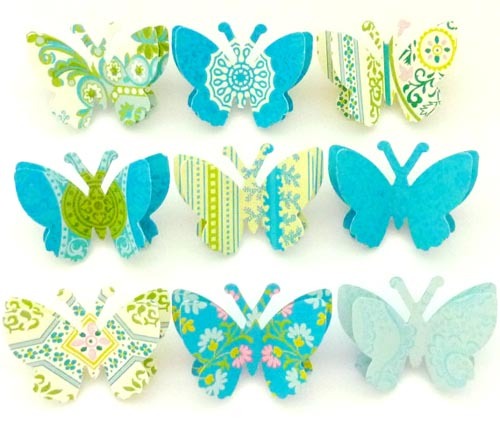 These butterfly pins would look great on an office wall or for an inspiration board. Kristine of Beach Cottage Studio in Charleston, South Carolina, has created these lovely sets of 9 push pins for $8.95. You can also find butterfly paper clips and bookmarks on her site as well. And the good thing is she keeps adding new color themed sets to her site...too fun, thanks Kristine!